The Golden Triangle is a classic introduction to the first time traveller to India. This is a wonderful journey taking in the famous historical icons of the ‘Golden Triangle’ of Delhi, Jaipur and Agra highlighted by visits to six World Heritage sites. This tour is an ideal way to feel the rhythm of our eclectic country, from the cosmopolitan frenetic Delhi, with its wealth of architecture and history, to the magnificent Mughal and Rajput forts and palaces of Jaipur, and the ultimate expression of love at the Taj Mahal. 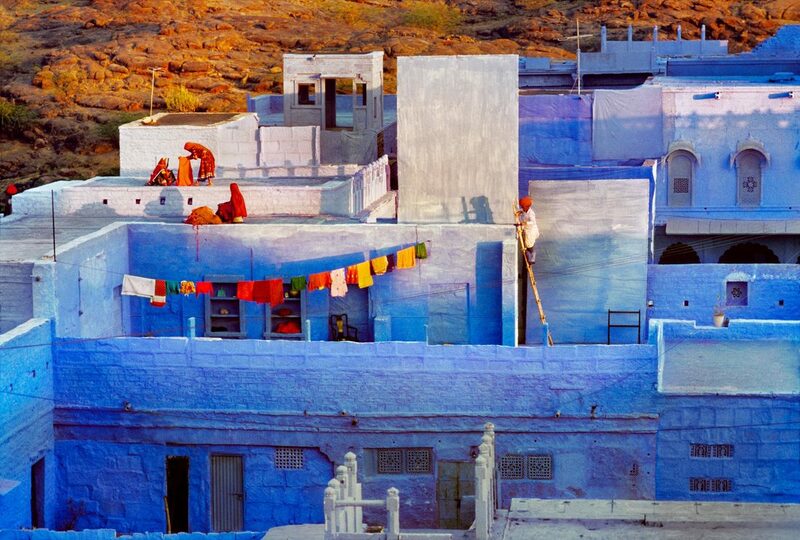 Rajasthan, whose provincial capital is Jaipur, is home to the a great history of the Rajput kingdoms. The three dominant princely states continue to be based in Jaipur, Jodhpur and Udaipur and an exploration of these cities immerses you in Rajput culture. Forbidding forts sit-atop rocky citadels, their battle-scarred ramparts reflecting a martial history. Spiked doors that once held warring invaders away gives way to fantasy and opulence once safely inside. Carved marble archways, fountain-filled gardens and mirrored walls festoon the halls and rooms of palaces, many of which are now glorious hotels and museums, like the fort-palace of Amber, the pink sandstone Mehrangarh Fort, and the fairy-tale golden Jaisalmer Fort. Patronage of these monarchies drew artists and artisans and have resulted in stunning handicrafts and fine arts. Outside of these fortified cities, village life and rural traditions remain the same as ever, although the advent of the mobile phone means that development is changing lives and landscapes. The colours of Rajasthan are a riot to your senses - from the bright colours of turbans and saris in village markets, to the bejewelled mounts of camels and elephants at fairs; from the riot of colour in festivals such as Holi and Diwali to the flash of yellow of the leopard in Jawai or the orange of the tiger in Ranthambhore. The Valley of Kashmir is one of India’s most beautiful landscapes with high Himalayan peaks, fruit-filled orchards, flower-strewn meadows, picturesque lakes, and pine-forest clad hills. But the beauty of Kashmir lies in its history and its spiritualism. At the crossroad of the Silk Road, its only obvious that most of the world’s religious faiths have either been influenced by Kashmir or have left its mark here. Shiva-worship goes back to 3000 BC in Kashmir (the oldest ever evidence), and Buddhism spread into Tibet, China, and Japan through Kashmir. The medieval era brought the permanent and lasting influence of Persia and Sufism and Islam into the valley, and left behind a rich tradition of food, art, craftsmanship, and literature. Empires of the Mughals left behind their beautiful royal gardens, a luxurious houseboat lifestyle, and splendorous architecture. Later colonial and postcolonial influences gave rise to Kashmir’s popularity as a winter sport destination, and today it offers some of the best skiing in the world. Kashmir is still politically volatile, with July and August often the 'season' for shutdowns, demonstrations and curfews. But with an increasingly prosperous Indian middle class, tourism income is beginning to change the region, bringing much needed peace. When planning travel into Kashmir, always look for a balance between home-country advisories and the advice of our team, who have feet and ears on the ground that will give you the actual picture. Right next door to Kashmir, in July & August, while all of India is soaked in the life-giving nourishment of the annual monsoon, up at 11,500 feet high in the far north Himalaya plateau, Ladakh is experiencing dry, sunny and mild weather – the perfect foil to a wet Indian sub-continent. Ladakh meaning the “land of passes” is one of India’s most photogenic destinations, yet also, one that you hardly associate with the rest of the country. While Ladakh is in all respects a part of Tibet, however, due to its remoteness and sheer inaccessibility have meant that it was to have a very different history to the rest of the high plateau, and has remained protected both culturally and militarily. Ladakh is dominated by rugged snow capped mountains, deep turquoise lakes like Pangong, rugged cliff-hugging monasteries at Hemis and Thiksey, and rushing rivers like the Shyok that feed into the mighty Indus. Along the river are valleys such as Stok, Leh and Nubra with tendrils of lush-green – orchards laden with fruit, and fields filled with golden barley. ​For years, Ladakh was the purview of backpackers who made the road trip from the smoke-filled cafes of Manali over the high pass of Rohtang by bike or bus. Today, with good air connectivity to Delhi and better infrastructure on the ground, you too, can visit Ladakh, without roughing it out (unless you choose to!). A visit to Ladakh generally ranges from 6-10 days, and one in which you need to give yourself a day and a half to acclimatise to the rarified atmosphere. With spectacular snowy peaks and plunging river valleys, beautiful Himachal & Uttaranchal are home to charming colonial-era hill stations, national parks teeming with bird and animal life, and spectacular rivers that forge and offer and wide range of adventure sport. But there is much so much more. Convoluted mountain roads bring you over passes into surprising valleys, each with its own identity, culture and lifestyle. Starting west in Himachal, the Kangra Valley has delightful little towns with well preserved architecture, tea estates, and artisan villages. A charming train service that traverses the valley, filled with friendly locals, is a lovely way to immerse yourself in every-day life. To the east and north, are the iconic (and sometimes crowded) hill stations of Simla, Mashobra, Kullu and Manali. In McLeod Ganj, the Dalai Lama's home-away-from-home, and in Lahaul and Spiti, with their centuries-old Buddhist cultures, you might even think you’ve stumbled into Tibet. East of Himachal lies the source of India’s sacred rivers - the Yamuna and the Ganges, and befitting this, Uttarakhand is a place of legend and holy mountains. Charming (and again crowded) pilgrimage sites such as Rishikesh and Haridwar are perfect to witness and experience the frenzy of Hindu rituals, without the chaos of Varanasi. These same rivers are source to some of the best white water rafting in India. The British left a lasting impression in the Kumaon and Garhwal Himalayas; Garhwal is home to Mussoorie and Dehradun, cool-weather destinations for the British Raj from the Delhi summer. The Kumaon became popularised by its most important resident, Jim Corbett, the explorer, wildlife hunter, and conservationist. The Corbett Tiger Reserve is one of India’s most beautiful protected landscapes and its set against the backdrop of picturesque mountain villages, clinging onto steep slopes in Binsar, Nainital, and Ranikhet. Many residents of New Delhi have escaped to the hills and built beautiful retreats and villas with stunning views of the Himalayas - places that are perfect respite from an intense India experience. The Gangetic Plains are what most people consider the beginnings of India’s history and spirituality, primarily to do with the live-giving properties of the River Ganges. Uttar Pradesh and Bihar are scenes of intertwined religious and historic events - from the legends of Ramayana in Varanasi, to the birth of Buddhism in Bodhgaya to the strong influences of Islam in the kingdom of Awadh. Apart from the iconic Agra, usually visited as part of the Golden Triangle, Uttar Pradesh is home to Varanasi, India's holiest city, famed for its cremation ghats and vibrant ceremonies along the Ganges River. Even though the city can be an assault on the senses, the right way to immerse yourself is to find an insider to walk the narrow alleyways, discover the stories behind the cities poets and writers, and learn of the legends of what is arguably the oldest continuously settled city in the world. West of Varanasi, lies the capital, Lucknow. This is one of India’s true gems, off the tourist map with a multi-faceted history created by the Mughals, Nawabs and the British, who made their mark, leaving behind architectural and gastronomic masterpieces – leave your vegetarian alter-ego behind, go with an empty stomach and digestive tablets! If you can look past the orange-and-black tiger, then Uttar Pradesh has some magnificent wilderness and unique wildlife to offer. In the west, close to Agra, see the endangered gharial crocodile at the Chambal River Sanctuary. Close to the Nepal border, is the Dudhwa National Park, recently equipped with a lovely wildlife lodge, giving you glimpses into the rare one-horned rhino and other magnificent wildlife at this rarely visited park. If you are keen on completing a full Buddhist spiritual circuit, then combine Sarnath and Kushinagar in Uttar Pradesh with Bihar to visit the hallowed Buddhist circuit of Bodhgaya, Rajgir, Nalanda and Vaishali, with Patna as your hub. Uttar Pradesh and Bihar are still in some ways reflective of the old India - so expect the unexpected, prepare to be stared-at and lose a sense of personal space. Its best to have someone hand-hold your travel in this region of the country.